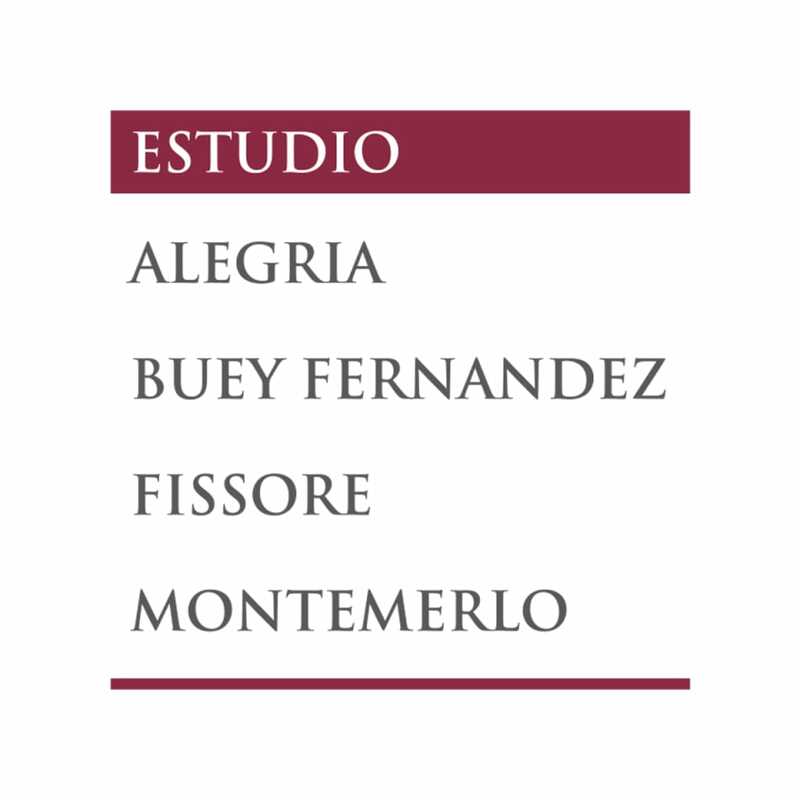 Estudio Alegria, Buey Fernández, Fissore & Montemerlo is one of the leading law firms in Argentina, highly regarded for its intervention in complex and sophisticated cases, and as provider of international legal services. Local and international specialised publications have profiled the firm's practice as the best for debt restructuring and bankruptcy cases and its members have been recommended among the best M&A practitioners in Argentina. The firm has consistently appeared and excelled in innovative, highly complex transactions, teaming up with specialist in other areas of law as well as with investment bankers, forming an interdisciplinary cohesive working group. This has not impaired the firm’s ability to develop sound and long-lasting relationships with clients in providing general corporate legal assistance. The firm has staff qualified, experienced attorneys, fluent in several foreign languages. Most partners have completed graduate studies and worked abroad. Insolvency/debt restructuring: The firm possesses unique expertise in bankruptcy practice, which has been highlighted by its performance in cases with nationwide repercussions. The firm has been involved in the most complex cases of bankruptcy, restructuring; litigation and intervention in judicial and out-of-court arrangements. Litigation and arbitration: The firm is engaged in international and domestic commercial arbitration cases dealt with under the ICC, UNICITRAL and local institutions’ rules. The firm also represents clients in litigation ranging from banking and securities regulation to class actions and other cases where complex commercial issues are involved. Corporate/capital markets: The firm provides counselling on diverse transactions, including mergers, acquisitions, spin-offs, takeovers, public offerings of securities, authorisations for listing on the Stock Exchange, corporate financing, joint ventures, foreign investments and transfer of technology. Banking and finance: The firm provides a full range of service in the banking business, including: the organisation and chartering of commercial and investment banks; mergers and acquisitions; rescheduling and restructuring negotiations; loan agreements; project financing; leasing; representation before the Central Bank and maters related to this practice, especially banking guarantees and regulatory compliance. It also advises on project financing. Administrative law: The firm also advises clients on administrative law. In this field, especially, the firm is frequently called upon by federal agencies and private sector entities to render specific advice owing to the specialisation and professional reputation of some of its members. Furthermore, the firm was actively involved in the privatisation of state-owned companies and PPP financing, advising international and major local clients in the bidding process, counselling on subjects such as structuring financial packages to meet tender requirements, establishing joint ventures and other business organisations to participate in bidding processes. International work: International deals on which the firm has worked include: representing the debtors in almost every largest cross-border debt restructuring; acting in several arbitration proceedings, both as counsel to the parties and some of the firm’s senior partners as arbitrators; incorporating and giving general corporate legal advice to international corporations (including private equity clients); and advising corporations and financial institutions in capital markets financing (debt and equity), project financing and PPPs.